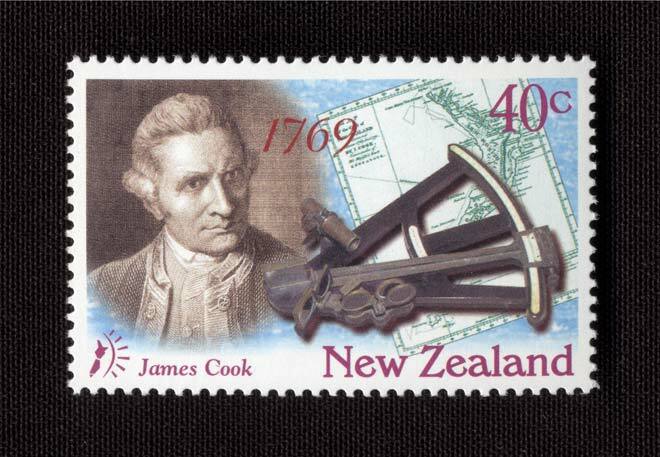 This stamp, issued in 1997 by the New Zealand Post Office to celebrate the navigational work of Captain James Cook, depicts his map of New Zealand and his sextant. Sextants were used to determine a ship’s latitude. They work by measuring the angle between two objects. The observer sights along a half-silvered mirror at the horizon and manipulates a second mirror until an image of the sun, moon, or a star is directed onto the half-silvered mirror and overlays the horizon, then the angle between the horizon and the celestial object is read off the scale. On 9 November 1769 James Cook and Charles Green determined the latitude and longitude of Mercury Bay during their observation of the transit of Mercury.